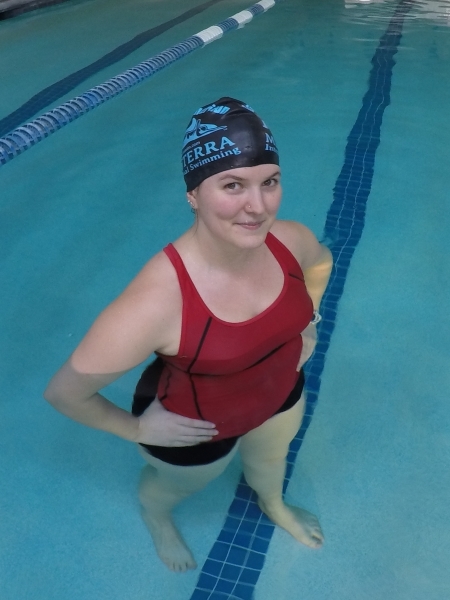 About Coach Jamee | Mediterra - Swim & Run Better Than Ever! Coach Jamee started competitive swimming in grade school in 1993. After a some years of the traditional ‘go harder’ approach to training she felt worn out. Though she was working harder she wasn’t going any faster, and eventually lost enjoyment of the water from the monotony of lap-after-lap. She left the water to pursue more interesting athletics and activities – dance, running, yoga. Many years later, in 2011 she was introduced to the Total Immersion technique and method of training and immediately felt it was what she needed to fall in love with the water again. She found TI to be engaging, challenging in the right way, and rewarding. It became fun again to swim. When Jamee began training in the Total Immersion way, it was enjoyable but it was not initially easy – she had to retrain muscles and carefully over-ride old habits that favored power-over-precision, and hard-over-smooth. It was perhaps more challenging for her mind than her body. But she immediately discovered that a more mindful swimmer with a more balanced, more streamlined body moves so much easier through the water. Coach Jamee specializes in teaching Level 1 skills and working gently and joyfully with those who are fearful of water. She offers private lessons and small group lesson series at Turtles Yoga in Beaverton. She has a wide variety of days and hours available. To inquire about working with Coach Jamee, please fill out the contact form below.